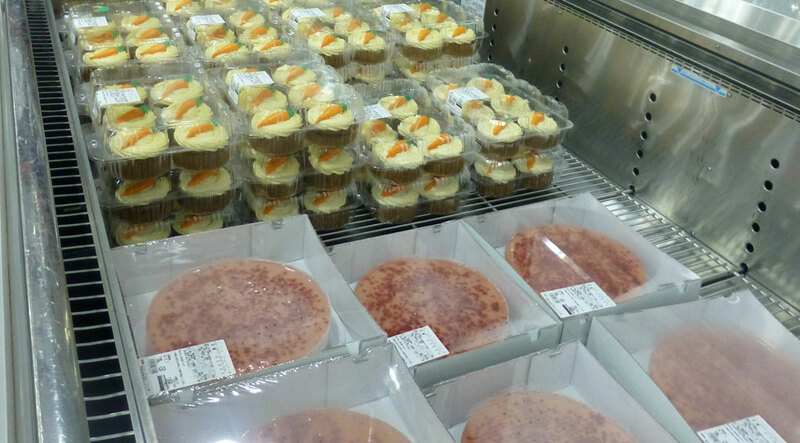 Bulk purchasing isn’t really part of our day-to-day life in Japan. Our 550 square foot apartment, which actually has quite a bit of storage, doesn’t really necessitate things like the Gorilla Metropolis Playset, a swingset that is almost twice the size of our apartment. Or even two-dozen rolls of toilet paper for that matter. Still, visiting a Japanese Costco was on our list of things to do. 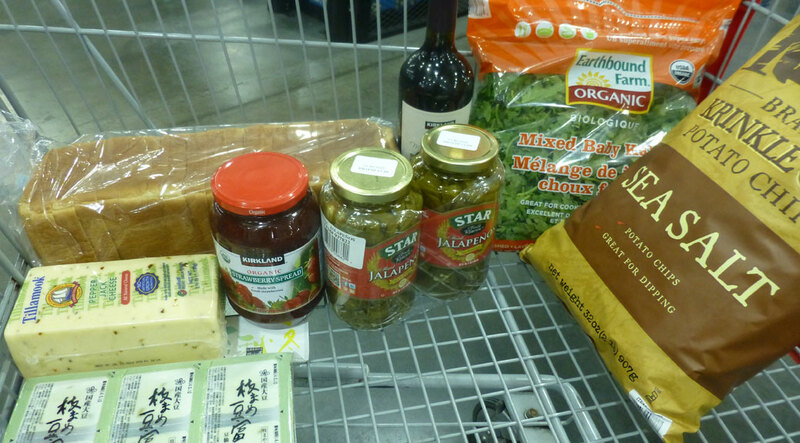 In the U.S., a trip to Costco every couple weeks was part of our shopping routine. A case of black beans here, a giant bag of tortilla chips there… things that would keep for awhile. Of course, we had a big pantry and a garage to keep all these things in. The closest Costco in Iruma was actually not the most convenient, requiring two train transfers and a bus ride, so we chose the other Saitama location in Shinmisato. 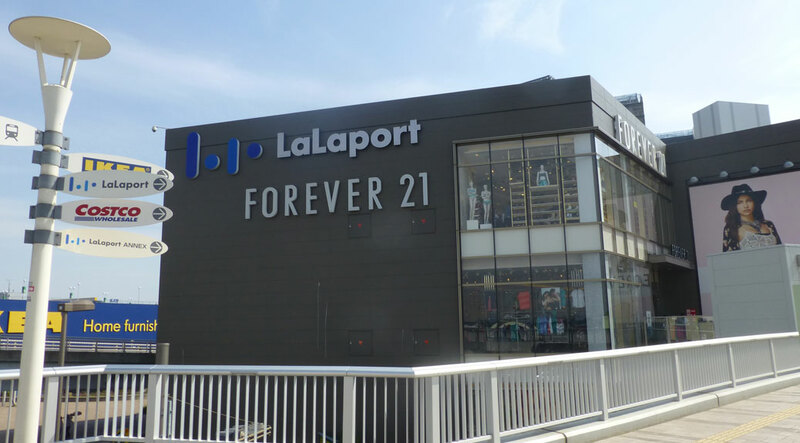 The train let us off right outside LaLaport, an expansive indoor/outdoor shopping mall with Forever 21, H&M, Columbia, Adidas; the best fashion stores America Japan has to offer. Ikea anchors the mall on one end and Costco holds down the other. That little girl’s about to start a riot for a Costco dog! As we approached Costco, it wasn’t any different from the ones we frequented at home. People packed the outdoor seating, attacking their ¼ pound all-beef sausage with all the toppings. Just outside the main door, the giant Costco weekly deals billboard greeted us with similar bargains as we’d find in the U.S. Frying pans, reading glasses, tires and tents alongside party-sized platters of sweet rolls and sushi. If sweet treats aren’t your thing, maybe the giant liquor section is? 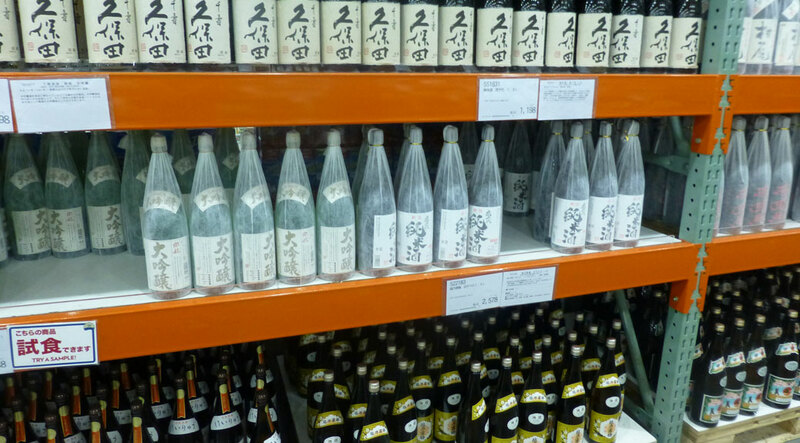 I’m sure it’s not that much of a novelty outside of Oregon where liquor sales are tightly controlled, but it was odd to us to see sake, tequila and whiskey for sale alongside the beer and wine. 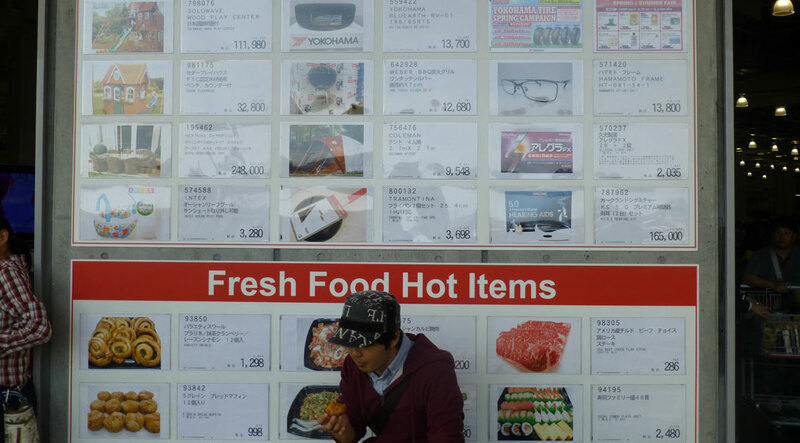 All of the product signs were in both Japanese and English, so we were able to put names to items we’d seen other places, but couldn’t identify. In the end, our cart ended up very similar to what we’d buy at home. Sea Salt Kettle Chips (from Salem, OR), Tillamook Pepper Jack Cheese (from Tillamook, OR), strawberry jam, bread, pickled Jalapenos, baby kale and a bottle of Kirkland-brand Malbec. We did buy one distinctly-Japanese item: edamame tofu. The little squares had whole edamame beans (soybeans) inside. No trip to Costco is complete without swinging through the snack bar. 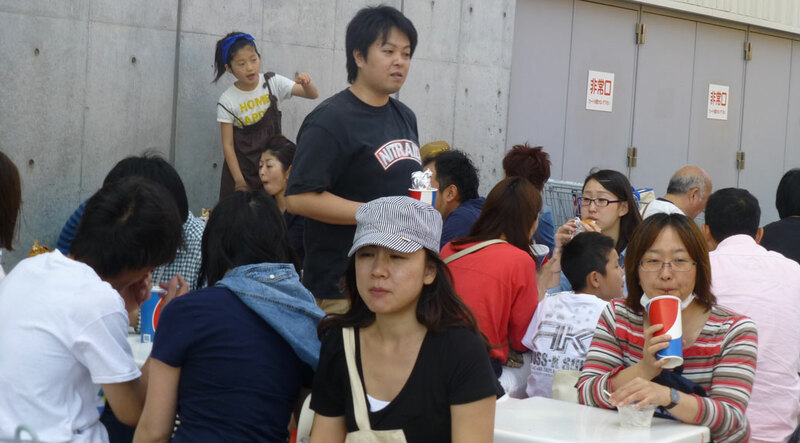 The famous ¼-pound hot dog—which has a better ring to it than the “0.11339809 kilogram hot dog”, even in metric system Japan—was a crowd favorite. Pizza, coffee, churros and ice cream were paired with some new-to-us items, including clam chowder, pineapple smoothie and bulgogi (Korean barbequed meat) bake. 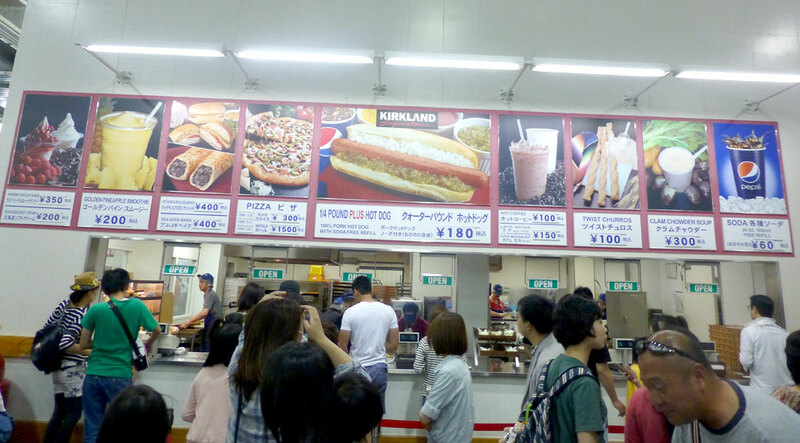 We ordered a slice of cheese pizza and a Hokkaido soft-cream sundae with raspberries and chocolate and sat down amongst the masses, relishing our first Japanese Costco experience. Shopping malls are alive and well in Colombia. When we were in Barranquilla, we were surprised to find a Home Center store that seemed to be a carbon copy of Home Depot. Turns out it’s part of a chain owned by a Chilean conglomerate that has Home Centers and Target-like stores throughout South America.